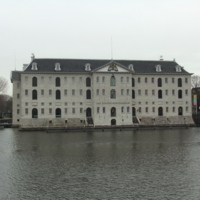 Het Scheepvaartmuseum is the National Maritime Museum of the Netherlands. Housed in a seventeenth-century naval storehouse, the museum showcases the ways in which Dutch culture has been influenced by the sea. A vast array of collections, including paintings, maps, maritime instruments and weapons illustrate these stories. Just outside the museum, there is a replica of an eighteenth century ship, the Amsterdam, which once sailed between the Netherlands and the Dutch East Indies. 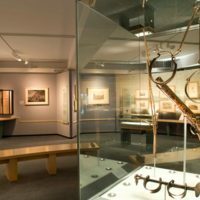 With fifteen permanent exhibitions and a free audio tour, the museum's four million annual visitors are exposed to over five hundred years of both Dutch, and world, history. Dutch involvement in slave trading is highlighted in the 'See you in the Golden Age' exhibition. The interpretation here focusses on the seventeenth century, a time when the Netherlands was one of the most economically and culturally rich countries in the world. While the exhibition reflects this boom period through a variety of collections, it also illustrates the darker side of Dutch prosperity. By making use of contemporary narratives, the museum provides its visitors a chance 'meet' historical characters including Amimba, a young African girl who was forced into slavery.